These are some great reads!!! I recommend them to everyone. I have immensely enjoyed reading them and enjoyed the authors and their finished work they put into the books. They are good whether you’re a new believer in Christ, mature or in ministry or any ordinary Christian! If you are really like them and want to purchase them, if you click on the book(s) themselves there’s a link to purchase them. What an amazing book!!!! “Hope Unseen” talks about Cpt Smiley’s amazing story of heroism, heartbreak, trials, and tribulations of being in war to being blind as a Lieutenant. Accidently ran into this book when I was at US Army Chaplain school, but what an incredible story about adversity. This book will truly bless you and also make you realize how grateful you should be and nothings impossible with God if you believe. This book is for everyone, even if you are not in the Army. I hope that you buy it and it blesses you. This truly is a great read- Billy Graham, one of the greatest evangelists, chronicles his lifes ups and downs in ministry, and his triumphants, trials, and tribulations in spreading the Gospel. Most of he leaves a legacy of what to expect in the next life and a great last chapter about Heaven. This book is for younger, older, and new and old believers alike. Bill goes into depth about how rich the Christian life is, and how its never too late to walk with God, and to submit to his Will. Whenever Billy gets ready to enter Heaven, rest assured God will give him a grand entrance. Great read!!! Great book! Satan is for real and he rules this Earth, individuals, governments, and principalities of darkness and evil- this book talks about it and what Christians should do to arm themselves for spiritual warfare. I find it interesting how many ministries, pastors, and people omitt Satan in the Bible and don’t realize the havoc and oppression he has on individuals and their lives. Any Christian should read the Word and know his tactics and as Ephesians 6 say, put on the whole armor of God to stand tall. McCallum uses what scripture says diligently, and personally examples in ministry and how to dispel the myths and lies associated with him. Friend and author Frank Shelton JR sent me a terrific book when I really did need it. This book is not so much about Frank’s biography, although at the ending he does a pretty good job of spilling his own beans. It’s about people in the church that are hurting, and in need of a savior, and how God used their brokenness for HIS blessedness. Using a variety of different backgrounds, one from an amputee Marine, cancer surviving, scandalous affairs, and from well known Christian artists each tale chronicles their job and brokenness in God’s kingdom and the road that he marked out for them. If you ever have doubts about your calling, question your salvation, and question God and your faith, look no more. This book dispels all the myths and puts you front and center right where God wants you, so you can rely and lean on him. Whenever you get down or start to contemplate the afterlife this is an excellent book to start. I don’t try to buy too much into the life after death experiences but this book was pretty compelling how a 3 year old boy literally went to Heaven and back and saw Jesus and so forth. I try to concentrate on what Jesus says about Heaven in scripture and not about too many people’s experiences. But I do believe God can use people for his glory to more tell about himself and that there is life on the other side, and for believers there is hope in Jesus Christ, while those that don’t know him there is not. If you scrolled down you will see I also mentioned “90 Minutes in Heaven” by Don Piper, which was really good too and his trip was not as intimate or detailed as Colton’s. This is a good read for believers, the only thing I disagreed with is people having wings, which seemed a bit off from other people’s accounts and not relevant to what I see in scripture as what believers have in Heaven. Other than that it’s a good read that will entice you and bring out your curiosity and also what scripture says what heaven is about. One of the best books!! Jerry Bridges, my favorite author does it again with an amazing book that talks about how to Trust God- he goes in depth with what scripture talks about God’s sovereignty, his will over nature, people, life events, and disasters. Jerry Bridges uses the richness of scripture to spell out what the Bible says God uses and how he can use our pain and heartache for his ultimate glory and goodness and that he has our best interest at heart. A must read for anyone who is in the desert wondering, or just questioning God’s will and purpose for their life and left with the pieces to pick up afterwards. This book won’t disappoint you and will certainly keep you guessing, reading more chapter after chapter. A definite must read. Today in the church there is a big war going on for what is truth and what is not. Trevin Wax’s compelling novel about this issue goes deeper and it’s a conflict the church is striving to fight for- the Gospel. Many churches have watered it down or avoid talking about the Blood of Jesus, The Cross, Sin, and @#! *% altogther. Trevin Wax makes a compelling case for the true biblical gospel and how to spot a counterfeit. A must read for all believers trying to differentiate truth from what is the Devil’s lies. Although this book was written awhile back it has merits and value that is desperately needed today in the Church. Pastors in many churches have failed their congregations in being shepherds of their flock and instead have gone off to tend to ‘their own ministry’ but feeding crumbs to those in their own congregation who desperately need a shepherd. Granted, shepherds aren’t God or can do everything, but they should be there and be available to do the work God’s called them to. This book is about getting back to the basics and how Jesus used 12 disciples to plant the seeds among the beginning of his church and that it’s not always about the numbers. This book challenges all those in ministry to truly have a servant’s heart and serve God’s people through more than just preaching on Sunday. What makes a legend? Pastor Balsamo makes a compelling biblical and historical figuratives that link how God works in history and works in each of our individual lives. Using excerpts from America’s Great Awakening(s), to his own personal biography in ministry and experience with other people. Pastor Balsamo mentions servitude a call that all Christians should embolden and pursue and it’s the giving nature in all of us that most exhibits Jesus Christ and our Christian identity. This book is great for new and mature believers alike who want to know what God has in store for their everyday lives. John Bevere’s “The Bait of Satan: Living free form the Deadly Trap of Offense” is a great book that all Christians need to read. We can all be easily offended, we’ve all had someone who has betrayed and hurt us-as the scriptures say we will take offense! But learning how to handle it the way how Jesus did, is key. John Bevere talks about stories about how Christians have an unforgiving spirit and how many live a whole life of being in bitterness, unrepentant and harbor unforgiveness, never fully bearing fruit in their calling and walk with God. As Jesus died to forgive our sins we need to forgive others. John Bevere gives a compelling look into scripture verses that closely associate with this, along with real life stories of his own and many others he’s herd of and even shared with that have this attitude and how betrayal does happen in all our lives. I recommend this book to all Christians. Many Christians need to have a better attitude and learn to walk in God’s love and know what God’s perfect love is all about. Christians cannot fully come to fruition in their walk with Christ unless they deny Satan’s Bait and instead walk in obedience to God and His forgiveness. Russell Moore gives a compelling account in “Tempted and Tried: Temptation and the Triumph of Christ” is a great account and he goes into details about Jesus being tempted in the Gospels and how all Christians can use that dichotomy to fight back temptation. I think that Moore makes a compelling argument and goes not into specific temptations (lust, finances) but other struggles Christians face on a daily basis. “No matter what it is that you’re struggling against, you are a sinner, but you are not a freak” is a good quote from him. He goes on further that “The Gospel exposes you as a sinner, and the gospel embraces you as a son or daughter. Claim your new identity, and don’t fight the Spirit as he seeks to crucify the old one.” As Christians we face new and different temptations everyday. Out attitude is what determines how to deal with them, armed with the Word of God. Moore gives a compelling understanding on the temptation itself and how to battle against it as a Child of God. What a phenomenal book by Bill Perkins. This a book that every man needs to need. All men sometimes struggle with sexual temptation and temptation in general. Bill Perkins lays out a comprehensive plan, with biblical-God related solutions as to how all men can stand up against temptation when it comes knocking at our door. Out of all the ‘help’ sources out there you won’t find many. Bill lays out how to ‘avoid’ rituals that lead us into the temptation, list how the benefits of getting sexual purity outweighs sexual impurity. All men struggle with this issue and when backed in a corner are usually ashamed, feel guilty, and how to overcome it in God. Bill lays out a solid plan how to avoid temptations and traps and not be persuaded by the enemy and uses his own historical account along with those of others he’s encountered. Above all you need to trust in God and who he says he is and trust that he will help you overcome addiction. God does not tempt us and the temptation will not be more than we can bare and he always provides a way out. Many who spend expensive money on fancy counseling techniques and study guides are wasting their money- instead they need to buy this book- APPLY it and let them know that God does love them and has a plan and purpose for all of us and addiction can be overcome by God alone and not ourselves. Bill tells us that when we come across addiction we are having an identity crisis and we have to remind ourselves who we are in Christ everyday. Wow- I just finished reading an amazing trans-formative and instrumental book that ALL Christians need to read. I must say that this book is the apple of my eye- I read it at a time when I needed it the most. To be honest with you many Christians need a good lesson on God’s grace and the Discipline of Grace and holiness. We have our own distorted versions of what God is like and his grace and not from what the Word of God says. “Can we abuse God’s grace?” “Can we ever not deserve God’s grace?” these are critical questions that Jerry Bridges addresses (being from the Navigators ministry). Chapter after chapter he re-emphasizes the importance- read the bible everyday! We are being spiritually attacked and sometimes we like to believe our own lies, or the lies of the enemy. Jerry Bridges emphasizes our duty to God and our commitment to obey and be holy to him, while also acknowledging the abundance of God’s limitless, and abundant grace and that to live a life of holiness and to grow in him we have to have both- God’s great grace along with our pursuit of holiness. I think for many of us we tend to not acknowledge the working power of the Holy Spirit in our lives or the changing power it has to transform us more into Christ. Jerry talks about the Spirit’s role and also how Christians can get too caught off into two absolutes- lots of pride or lots of guilt. 1. How good is good enough? 2. The Pharisee and the tax collector 3. Preach the Gospel to yourself 4. We died to sin 5. Disciplined by Grace 6. Transformed into his likeness 7. Obeying the Great Commandment 8. Dependent Discipline 9. The Discipline of Commitment 10. The Discipline of Convictions 11. The Discipline of Choices 12. The Discipline of Watching 13. The Discipline of Adversity. Jerry takes readers in depth into all of these chapters in pursing God’s holiness and the disciplines of his grace. Once we know what God’s grace truly is, it doesn’t give us an excuse to live reckless, disobedient Christian lives, but to live for the fullest for him, always pursuing holiness, and knowing his grace is abundant and always there even if we do fall or do sin. I bought this book by seeing the author on Joyce Meyer and looking into John Eldredge I could see that the title and the content of the book, “Fathered by God” really did touch my heart. I didn’t grow up with a good father if one at all really, in my life. Eldredge takes readers (specifically men) who have been abandoned, not fathered by an Earthly father to lead leaders on the path to reaching God’s manhood and realizing and knowing our truth and heavenly father. This book spoke volumes to me. I grew up with a single parent raising me and my sister and we never had a father there and the memories I had of him weren’t very good. This book begins to take men to a journey of healing through the love of Jesus, scripture and what it means to be fathered. He goes onto the stages of becoming a man through “True Son of a a True Father”, “Boyhood”, “Cowboy”, “Warrior”, “Lover”, “King”, “Sage” stages of adulthood. Even if you have a father, it’s still a great book for all men to relate to. It especially related to me about as a young adult how to have that fatherly presence in my life and how to look to those that have that and to know that our heavenly father is always there for us. A great passage he talks about being ‘Fatherless’ is “Our core assumptions about the world boil down to this: we are on our own to make life work. We are not watched over. We are not cared for. Whatever our fathers might have provided, we are not much different now than Balian at the start of his story. When we are hit with a problem, we have to figure it out ourselves, or just take the hit. It anything good is going to come our way, we’re the ones who are going to have to arrange for it.” I think this passage along with the rest of what Eldredge espouses really hit home. Doing the calling God has placed in my life, along with interacting with people we have to know that no matter who are Earthly father is, it pales in comparison to our heavenly one. What an awesome book that really hits home. How do you deal with churches that are too heavy on grace or too heavy on truth? Alcorn makes a compelling case that you need both to be effective, something I strongly agree with. I think many churches have watered down truth to be more grace oriented, and then you have the fire and brimstone churches that don’t emphasize grace enough, and make you question your salvation. Alcorn demonstrates through out the book even using an abortion clinic as an example, that although they protest and in no way shape and form support it’s practices they do their best to bring the people that are going there for that procedure to bring them back to God’s love while speaking truth. I think this is a book all pastors should read and ordinary Christians. Alcorn has countless examples how a healthy balance between the two is essential to ministry and evangelizing. Chaplain Benimoff juggles trying to counsel and console soldiers while also trying to spread the Good News in a war zone. A Chaplain’s duties are not easy and are perhaps the hardest the Army has. War is @#! *% , and seeing our soldiers in the middle of it and what they go through and then ministering to them and their needs takes a true servant’s heart and that’s what Chaplains are called for. Chaplain Benimoff’s experiences were especially dye-ring as he served some of the worst regions in Iraq in some of it’s most turbulent times back in 2005… then being assigned to Walter Reed and seeing all of the veterans come home with a lot of PTSD and trying to create a life for themselves again, and cooping with survivor’s guilt. I must say I wept though a lot of the book… especially when he went to Brady’s grave, and dealing with the guilt of thinking he had done enough or not. His personal life sped out of control, having a difficult adjustment to his wife and kids with reintegration. I must say this book is for anyone who has been tested by God and to their limits. Chaplain Benimoff is the modern day Job. Chaplain Benimoff questions his faith and is presented with a serious of questions (i.e. why is there evil in the world, why is there war, etc, etc?) and other testing questions that theologians have wrestled with for years. Being a Chaplain takes a servant’s heart and I will say it also took a toll on his soul seeing the dead, the disabled and those mentally injured from war. I think this book wants me to be a Chaplain even more seeing what a need they are, and that it is truly a calling from God and that it takes a servant’s heart, and Christ’s love to truly do the job. This book revolutionizes how counseling should be done. It emphasizes hurts, hangups and habits and Edward Welch describes how people come from a ‘leaky cup’ and looking for some self fulfillment. This is for any Christian who is growing in their walk for God, counselors and even those that need to be counseled. For me I especially needed this book. A friend of mine recommended it to me. I struggled with a ‘habit’ ‘addiction’ and overcoming the shame and guilt and really overcoming it completely. This book really revolutionized my thinking into fearing God, serving and loving others and not using people for my means or find ways to gratify the flesh but to glorify God. In the end it’s about the Glory of God and how he gets it all. He can do the impossible and use impossible people to do it with. In fact with my job I will be doing lots of pastoral counseling while at the same time needing counseling for myself. It is helping me move on. To seek the Lord, fear him, serve him, and love others. 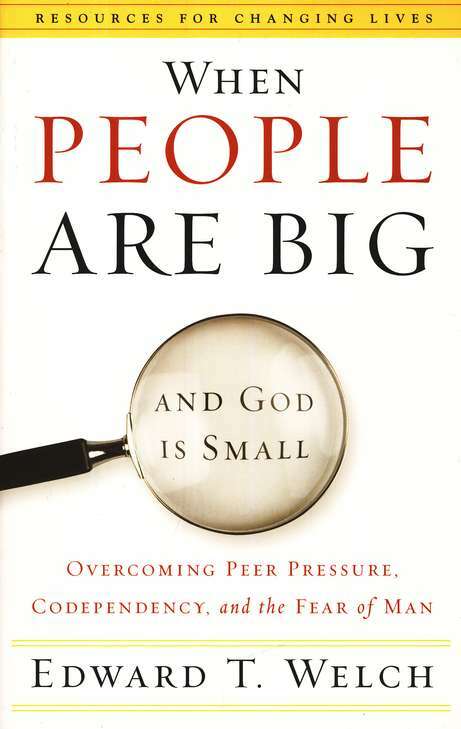 His book title fits it completely- “When people are Big and God is Small” that’s exactly what most of the Human race is doing right now. This book also helps us overcome peer pressure, fear of man, and our own short comings as we grow in our walk with the Lord to all believers. A highly recommended book. When I bought this book I was a little disappointed that it didn’t emphasize more detail on Heaven and only really had 1-2 chapters devoted to it. I started to realize the book was more about Don’s experiences and the gut wrenching pain he experienced when he back to Earth, dealing with the permanency of being disabled, and his personal walk with God. Perhaps the best part of the book is how his personal story has touched so many lives in giving so many hope that there truly is a Heaven and that Jesus prepared us for it. This book is also one how Don can use his position of being disabled to bring hope to many that are about their situation and people that coming near to death. His story has brought a lot of compassion and insight into converting believers with problems and those that are faced with death head on. Don’s story is of inspiration that all believers can relate to and that there is something far better God has planned for us than what’s here on Earth. I picked this book up and also read Bill Perkins “Six Battles Everyman Must Win”. This book is good about opening up and finding ways to battle and that you should go and surround yourselves with Christian men to talk about it. Also I thought it was imperative to hear what he says along with other men’s struggles to know we are not alone. This is a great book for any believe who is either starting new or a more mature believer that struggles with certain issues. I think any man can relate to this book and learn from Chad Hennings example. But I will say you don’t necessarily need a football player or Airfoce pilot to tell you so and you can look at the word in the Bible for further direction. This is a good book where disconnected men can come together and find comfort in one another and in God. I believe this is a good book that gives good insight in advice if your struggling with an addiction as mentioned in the book, and your following God. No one said it would be easy to take up your cross daily and follow God. His book he gives funny examples that other men to fail to live by and funny examples that he mentions that he has encountered during his ministry.This book is also essential to men who feel alone, discomfort and have no one to turn to- we should comfort one another and tell our struggles. At the end of the book he lives an outline how to win those battles. He gives funny and short stories about how to win some of the battles men face everyday. I recommend reading it more than once. You know I was at Books A Million feeling down with a current problem I had one Sunday and browsing the Christian book section. This book caught my eye and I was immediately hooked. I think Pastor Jones managed to stay so much on message with the novel- he has comedic, but yet tragic examples that are in his family life and his walk during ministry and emphasizes meaningful examples to illustrate in details Jesus love and quotes from C.S. Lewis who is a very influential and remarkable evangelical author. You know I think this book out of all the ones I have read was really up front with what believers are about in their walk with God. In our sorrows we read the word, we study with God, but sometimes we do still feel distant through him through our trials. I really liked what he mentioned about “Providence” and God working for us upstream. Some of the stories were heartbroken and heart wrenching with a lot of the real life examples he uses, but out of the hard stories he manages to laugh with some funny examples to reaching out to those who need. I think his book has a repeated theme that my Church uses- loving God, loving others, serving others. I think Pastor Jones has emphasized that much and carries believers on to know that we all share the same pain- but the prize is always on for Christ. I liked that he uses Psalms and quotes the different context the verses are uses for and breaks them down into the three distinct sections. He also says that the traditional therapy, expensive books and audio doesn’t necessarily work but getting off the couch and serving others. I am not a member of Elevation and go to another church but I visit Elevation and have paid very close attention to Pastor Steven. He is a man of God, and his book only furthered that. He makes an interesting point in the book- it’s not about the destination, but journey. Sometimes as a believer we want our Sun Stand Still prayer to be answered immediately, or the way we want it, and it always doesn’t come the way we want. But we have to have hope and FAITH in an awe powerful, awe inspiring God, and if he has planted and birthed us a vision for us to pursue that is truly from him, it will come to fruition timing is right. God has made the Sun Stand Still recently in my life with my finances, job, and my faith in God. I recommend this book for anyone to know God loves them and has a bigger plan and purpose for all of us we could never imagine.